When the 500 range was launched it initially only replaced some of the 400 range units. The first publicity catalogue to include the new 500's reflected this in terms of its mixture of contents. The above images show the front cover of the new booklet along with the contents page. 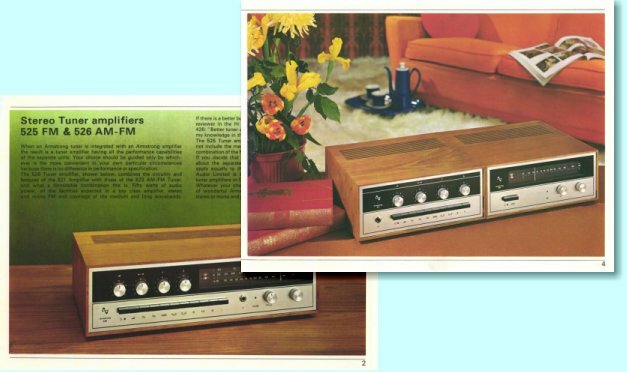 The units described in the booklet are the 521 amplifier, 523 and 524 tuners, the 425 and 426 tuner-amplifier (receivers) and the 127 tuner-amplifier (valve receiver) as well as the M4 stereo decoder. Electronically, the 500 range was almost identical to the 400 range, so the internals of the 400 and 500 range units were essentially the same, with only the very different external styling to distinguish one range of units from the other. The visual/mechanical designs of both the 400 and 500 ranges were produced by Philip Connor Design Associates - a specialist industrial design consultancy. They also designed the publicity booklets shown here. The booklet shown above contains a printing error as it lists the 523 as ‘623’. In due course the last of the 400 range units were dropped and the 525 and 526 tuner-amplifiers replaced the 425 and 426. At about the same time the 127M (the last surviving valve unit) finally ceased production and sale. The styling of the 500 range proved far more attractive and successful than the 400's. The 400 range styling was bold, but probably not to the taste of many prospective buyers. Whereas the 500's had what now can be seen to be a ‘classic’ 1960's appearance that fitted superbly into many living rooms of the period. Indeed, the wooden-cased boxes and screen-printed facias can be said to be rather more attractive than many modern all-black metallic creations that seem more suited to a mission control center than a living room! 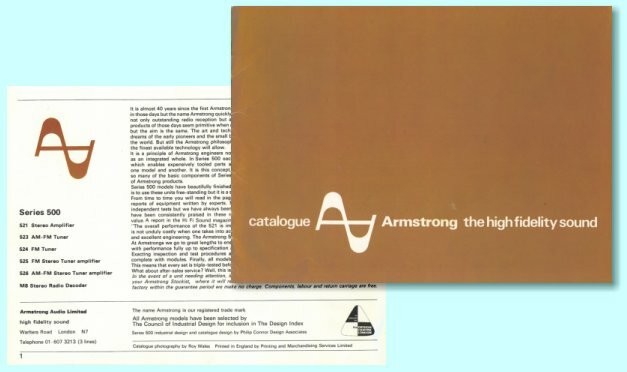 The brown-covered booklet for the 500 range also set the trend for a whole series of later Armstrong booklets, pamphlets, and manuals. 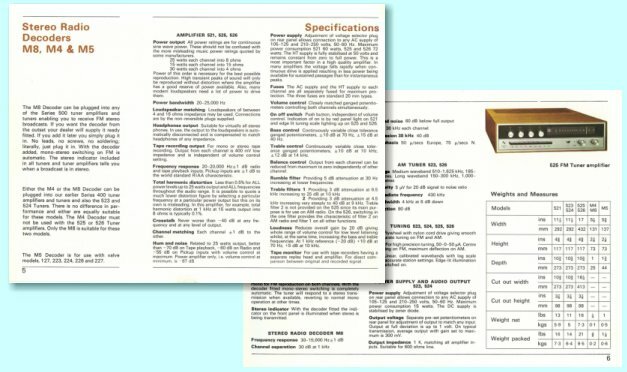 Throughout the time of the 500 and 600 ranges, most booklets had the same ‘landscape’ aspect ratio and size, and general presentation. They included some superb colour photographic illustrations as can be seen from the above images, again taken from the brown booklet. 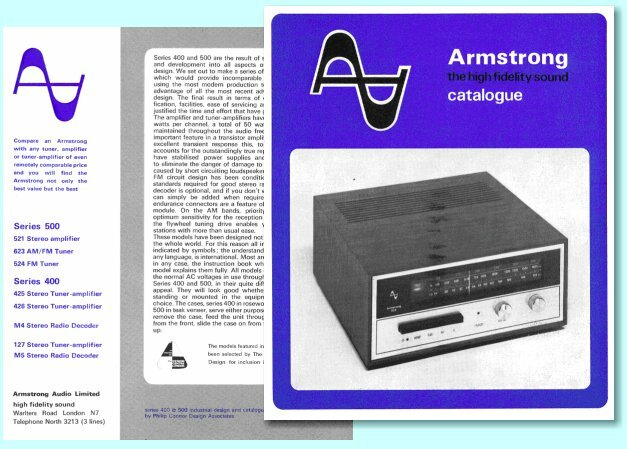 At the back of each publicity booklet there was a detailed specification of all the units, including all aspects of performance, as well as the size and weight of each unit in the range.